Bangalore Monkey: I'll Take 20 of "I'm with Stupid"
[In] Calcutta's New Market, an unspoken caste system exists between Indian shoppers and souvenir-seeking tourists. The travelers instinctively gravitate toward boutiques that sell carved elephant figurines and decorative jars of saffron, while the Indians shop for rubber bathmats, stainless steel pans, and digital calculators. Buying an electric blender might be more representative of day-to-day Calcutta life than buying Kashmiri silk, although, admittedly, a blender would not look as good in your living room. But that Indian blender might look awesome in your kitchen, especially once you get that voltage thing sorted out! I agree with him that "department stores and supermarkets" are often a better source for good presents than a souvenir shop is likely to be. Let's just say that when I finally do leave town, my suitcase is going to contain lots and lots of tea. And chickpeas. 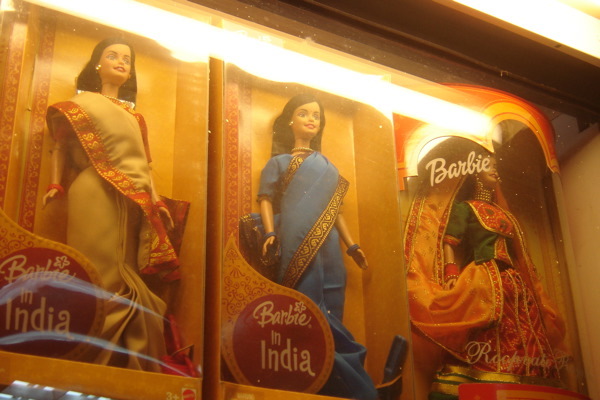 And maybe one of those cool sari Barbies. Hey! 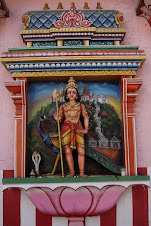 My little sister is in Bangalore for the next month, too! She flew in on the 22nd and she really wanted a pet monkey. Alas...no monkey for her. I think it's illegal or something. I don't know. My husband and I are in Amman right now so my sister wants us to visit her, but it isn't going to happen...we'll have to keep checking on your blog to "experience" India. chickpeas? Are you sure its not easily available in the place that you are moving back to? Oh i think you can also get the indian blenders in the US with the voltage sorted out, probably for a premium though.